Penn State's recycling bins still list "Styrofoam," but the university recently announced it will no longer be recycling it. Joanne Shafer is deputy director and recycling coordinator at the Centre County Recycling and Refuse Authority, where two years' worth of Penn State's polystyrene sat when the market got bad. The nearly 5,000 recycling bins on Penn State’s University Park campus collect all kinds of materials: bottles, cans, paper, but no longer polystyrene, which is often referred to as Styrofoam. The school has recently decided not to recycle polystyrene for a slew of economic reasons, one being the fall of oil prices. Lydia Vandenbergh is an associate director of employee engagement with the Sustainability Institute of Penn State. She says the decision to start recycling university dining containers and packaging around 2000 was appropriate then. The university has not successfully recycled any of its polystyrene since 2012. Even though the material is cheap to buy new, few facilities in the state accept polystyrene for recycling. Joanne Shafer is the deputy director of the Centre County Recycling and Refuse Authority where two years' worth of Penn State's polystyrene sat with no place to go. In 2015 that final load of Styrofoam was laid to rest at a landfill in Elk County along with Penn State’s grand idea of recycling it in the first place. Even when oil prices are high, polystyrene – which is made of oil - is much cheaper then alternatives like compostables. And the high oil prices mean it’s economically feasible to recycle it, even though recycling it is difficult. But when oil prices drop, so does the cost of new polystyrene. When new foam and recycled foam reach the same price, manufacturers almost always buy the new stuff. And the bottom falls out of the polystyrene recycling business. Tim Skammer has been in the scrap business for 23 years and now runs a plastic brokerage business with Accurate Recycling Corporation. Aside from oil prices, he says the major costs of recycling polystyrene come from how difficult the material is to work with. Penn State uses an estimated 35 to 40 tons of foam per year according to analysis from the university's Office of Physical Plant. The low cost of expanded polystyrene can be attributed to the fact that it's 95 percent air. That means it's pretty inefficient to transport. A ton of garbage may fill one tracker trailer, while a ton of polystyrene may fill four. Just transporting it to a recycling facility requires more cash and gas than most recovered commodities. In a recent analysis comparing costs of preparing recyclables and transporting them to market, Office of Physical Plant Supervisor Nadine Davitt found that in recent years traditional recyclables have cost the school around $67 per ton, while polystyrene costs $850 per ton. When considering Penn State's history with the hard-to-recycle commodity, Shafer from the recycling and refuse authority says there's a moral to the story. 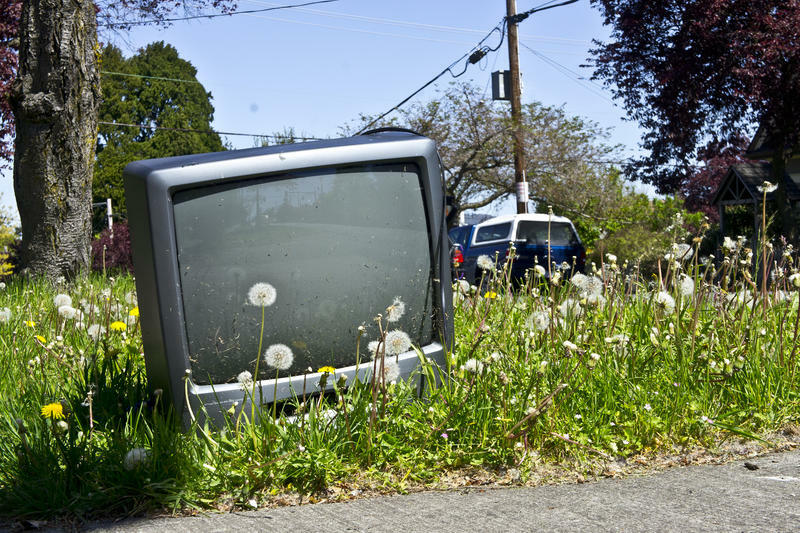 “The road to zero waste starts at the beginning not the end," said Shafer. She says in order to promote sustainability, more compostables should come onto campus instead of struggling on the backend with difficult recyclables. Penn State has experimented with compostable containers before, but Jeremy Bean of the Sustainability Institute says a complete switch would take a lot of financial planning on the school’s part since compostable containers are at least twice as expensive as polystyrene ones. He also says another difficult, but essential, step for any change in recycling policy to truly work is education. 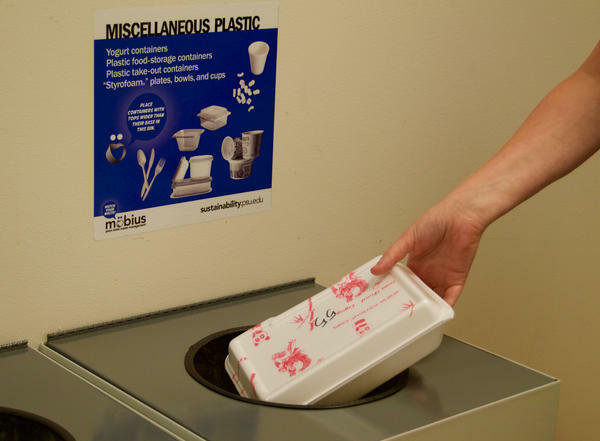 Polystyrene and compostable containers have both been improperly disposed of by students and staff. But Bean agrees that chipping away at the amount of polystyrene coming onto campus is important. He will be organizing a Sustainable Operations Council this summer to bridge the gap between those working in sustainability and finance at Penn State. Copyright 2016 WPSU-FM. To see more, visit WPSU-FM. Pittsburgh’s Jana Thompson takes her recycling pretty seriously. She’s even been known to pry the unrecyclable spouts off otherwise recyclable dishwashing detergent bottles. And check out her recycling bin, and those clear plastic salad tubs are stacked as neatly as a set of Russian dolls. 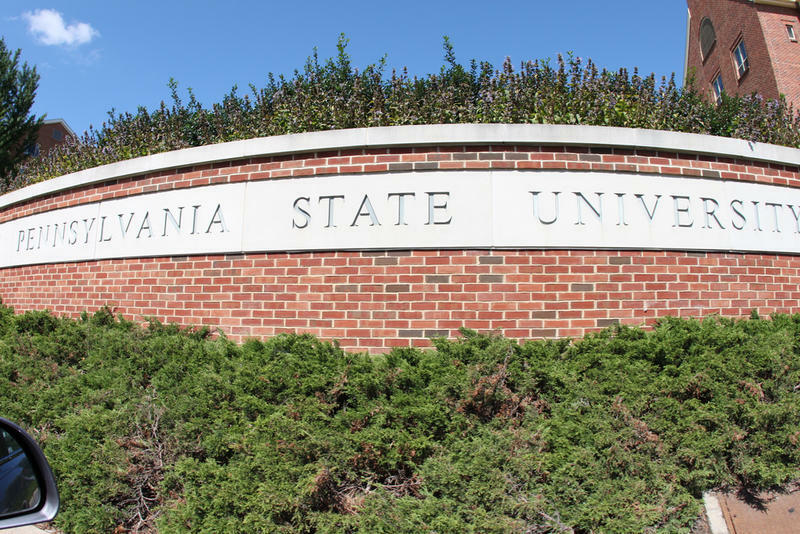 Pennsylvania's auditor general has announced a review of Penn State University's performance, focusing on governance, safety and tuition across its 24 campuses. Auditor General Eugene DePasquale said Tuesday that his audit will revisit former auditor general Jack Wagner's recommendations to the university following the Jerry Sandusky child sexual abuse case, as well as compliance with state and federal guidelines. He says it won't rehash the university-commissioned 2012 report by former FBI Director Louis Freeh.